President Barack Obama said bold measures should be taken to try to ease growing strains over the South China Sea, where six governments including the Philippines have overlapping claims. Following bilateral talks with Philippine President Benigno Aquino on the sidelines of the Asia-Pacific Economic Cooperation leaders’ summit taking place in Manila, the president drew attention to Beijing’s actions that have raised alarms in the region and in Washington. “We discussed the impact of China’s land reclamation and construction activities on regional stability. We agree on the need for bold steps to lower tensions including pledging to halt further reclamation, new construction and militarization of disputed areas in the South China Sea,” said Obama. For nearly two years China’s dredging projects on seven disputed formations in the sea have resulted in the creation of artificial mini islands that have caused wariness among its neighbors. At least two of the newly formed islands have airstrips and harbors that can handle military air and sea craft. Officials have expressed concern that China has not been specific about its plans there. China, which says it has “indisputable sovereignty” over practically the whole sea, has said there was no need for outsiders to weigh in on the disputes. The Philippines has filed an arbitration case questioning China’s claim to the sea. China has rejected the case and is not participating. Brunei, Malaysia, Taiwan, Vietnam also have claims in the resource rich sea. 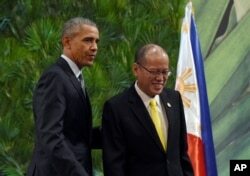 Obama again reiterated U.S. neutrality regarding the disputes, but also pledged his country’s “rock solid commitment” to the Philippines. 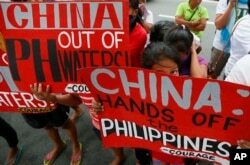 FILE - Protesters display placards during a rally at the Chinese consulate in the financial district of Makati city, east of Manila, Philippines, Nov. 12, 2015. The U.S. is the Philippines only defense treaty ally and the two countries last year signed an agreement that would see more U.S. troop rotations and prepositioning of American military hardware at strategic points throughout the country. But groups have challenged the agreement's constitutionality and it is stalled at the Philippine Supreme Court. Nevertheless, Aquino talked about what he saw as the benefits of the agreement. He said the Philippine military would have access to “modern technology,” which would strengthen its capabilities. Aquino also reiterated support for the U.S. military’s freedom of navigation maneuvers in the sea. “America gets the use of our bases to be able… to project its own power in the region, in an effort to help in the stability, and the orderliness and the diffusion of tension within the region,” said Aquino. On Tuesday the Philippines and Vietnam made their strategic partnership official after both sides signed a statement pledging to step up naval and maritime engagements. Vietnam’s prime minister affirmed Wednesday that Hanoi is seeking good relations with Beijing, while also defending its claims in the sea.